BreakMentalDown: I get more social mores with those adorable "Social Morays"
I get more social mores with those adorable "Social Morays"
Anyone who has read some of my previous postings (Case and Point) probably comes away with one realization—this guy would make an excellent writer for a Christian animated TV show! Excellent thought, and I wholeheartedly agree with you. But here's the rub, I actually did write for one. A little program called "Auto-B-Good" (you oughta know, you Auto-B-Good). 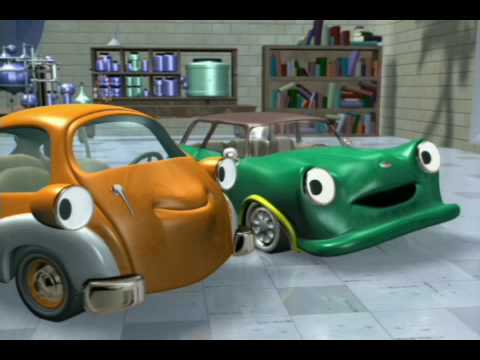 My main focus as a writer consisted of putting the car characters into situations where cars shouldn't be. This means I didn't write episodes where cars went around a race track (and around and around and around and around) or participated in a demolition derby—that's expected. Instead, I had them fly or put on productions of William Shakespeare's tragedy “Romeo and Juliet,” because cars in codpieces automatically brings funny. They never produced one of my episodes, but I did play a lot of Four Square with the animators. And from that experience, I have the background and ability to bring the next great children's animation sensation to TV stations throughout the land. But background alone does not accomplish this, you need to have an idea, and I have a great one. Are you ready for it? Everyone who has taken intro-level psychology knows what social mores are. I have not, so I have a vague recollection of what someone said to me once in high school. But I DO know the concept is pronounced (and you should too... mores = mor-ays). This will be the most perfect combination of 11th grade psych, and, well, eels. Now, we all know moray eels love hiding in crevices, but my show will ask the question—what happens when they get out and become social? I actually know absolutely nothing about morays, I just realized the pun is too awesome to pass up. So I took to reading Wikipedia for some good background on these delightful chordata. Apparently there's a reason morays are called “the teddy bears of the sea,” and it actually is because of their inherent cuteness. Many divers have claimed if they don't give a moray at least three hugs before leaving an area, they can actually see tears welling up in the eel's eye sockets. Which is especially impressive since they don't even have tear ducts. This format will lend itself to all of the great sitcom setups. In one episode the eels will use their electric ability to steal public access TV (service providers don't give cable access under the sea), and another could feature identical twin eels (Slimy and Martin) who confuse everyone by saying they're the other one—and nobody can tell them apart! Needless to say, hilarity ensues. But “Social Morays” will not be just the laugh-a-minute, eel-extraordinaire you'd expect from the title, I also plan on having a strong heart behind it (that is, if eels have hearts—Wikipedia, not so clear). Imagine “Blossom” without the titular character, and you get what I'm creating. Just imagine a “very special episode” where Nathaneel gets gets a hold of some RealSlime®, a slime enhancing hormone. While it's great and makes him stronger and it gets him all the female eels, is it really worth it in the end when it shrinks his genitalia. That is, if eels have genitalia (curses, Wikipedia!). Granted, we did use this storyline on Auto-B-Good, but eels aren't cars, so I'm totally protected. I realize shooting underwater and training eels could cost an arm and a leg (literally—again, they bite), but we can shoot this whole thing on the cheap. A sock placed over someone's hand looks conspicuously like an eel. As long as we don't use argyle socks, we should be set. 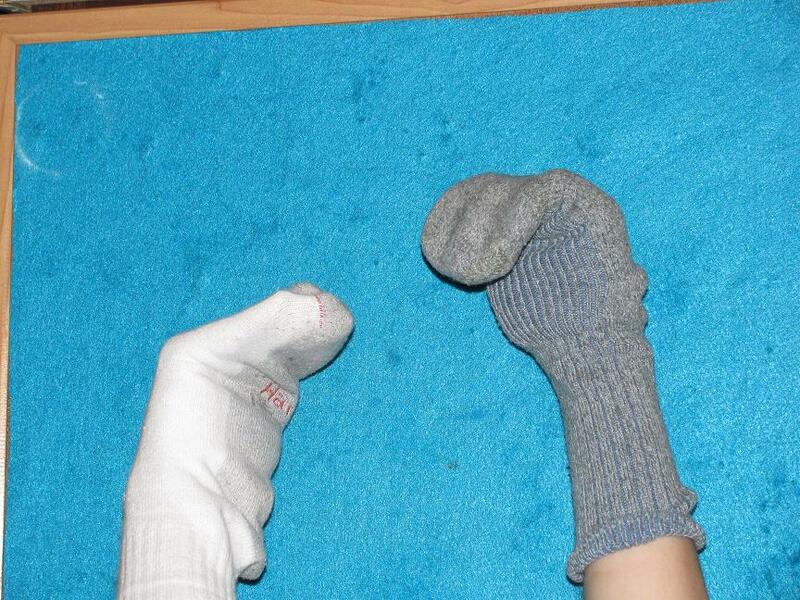 (Picture of sock puppets as the morays. Caption says “Feather reveals Slutette might not be the father of their child, or vice versa... if they swing that way). I can even do this whole thing on the cheap. It's a little known fact, but a sock placed on someone's hand looks conspicuously like an eel. I just need to make sure to not use an argyle sock, and I'm set. Let me rephrase that, we're set. I'll see you on TV sets across the land come this September!